As the housing crisis wreaks havoc and suburbia suffers a critical blow from the credit crunch, what will become of all those foreclosed McMansions? 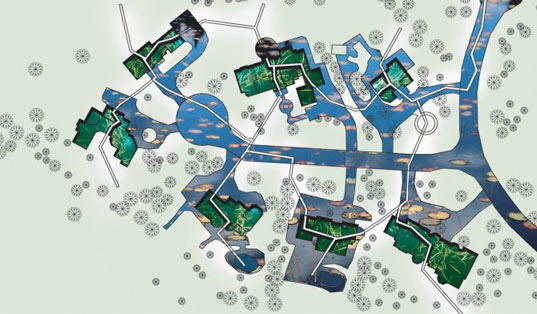 Designer Calvin Chiu has proposed one solution that seeks to reinvent these monuments to excess as micro-wetland ecosystems that filter and provide fresh water to urban centers. 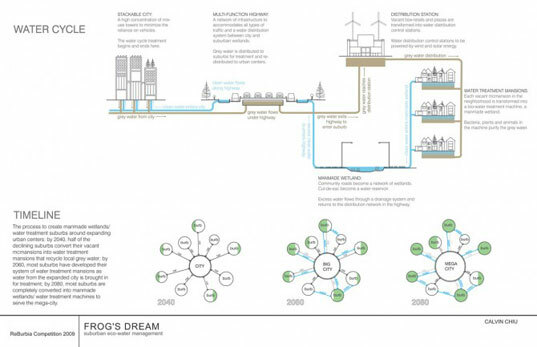 One the more interesting top 20 finalists in our Reburbia Competition to redesign the suburbs, Frog’s Dream takes an inspired approach towards preserving the wetlands, solving the water crisis, and ensuring the sustainability of our cities in one fell swoop. Many believe that a shift of suburban population to higher density dwellings is inevitable. A Frog’s Dream bridges the existing gap between city and suburb by not only re-purposing existing infrastructure and domestic real estate but also efficiently utilizing their potential for enabling sustainability. The project outlines a new approach to waste management by transforming vacant McMansions at the periphery of cities into eco-water treatment machines. These micro-ecosystem of plants, algae, bacteria, fish and clams are put in place to purify the water, while the formation of micro-wetland ecosystems sustain larger plants and animals. These living machines will be connected by highways that will serve as a multi-functional infrastructure to transports cars, trains, bikes, and water between the city and its surrounding suburban wetlands. We may not know what the future will bring, but the Frog’s Dream sheds light on an existence where people value natural resources, and strive to regenerate what has already been lost. Not bad. Its not easy to produce an excelent example when an idea is new and every piece of suberbia different. The cosept is cool as there is the need for water treatment end the energy to move the water. On a small scale there may be someplace to utilize this concept. Catails are being used today to treat some municaple sewage. The catails can be used to produce alcahol methain and biodesiel for fuel. Also feed and building materials. Just curious - are the mc mansions going to still be used for housing? And where will all the water come from? Especially here in southern California? I can't tell if this a good idea or not, because the images and text are too small to even read.